If you’ve ever owned an RC vehicle, then you know it works using. . . well, a remote control that came with the car. That notion changed a year ago when Silverlit launched their first Bluetooth controlled RC vehicle that instead uses your iOS device to drive the car. A differentiator is the integration with your iTunes library which they’re calling “RC Radio.” Not only can you play music through your iOS device while you’re "driving," you can also play music through the car. That’s right, the Mercedes Benz has built-in speakers that will play though the Bluetooth connection. But how you stream music is even cooler – like the real SLS AMG, this car also has Gullwing doors that open remotely using your iOS device to reveal internal speakers. The working headlights, taillights and turn signal lights will flash to the beat of your favorite tunes and the Gullwing doors bounce to the beats. To quote a Sheryl Crow song - if you just want to “shut up and drive” the Silverlit vehicle has full gesture control. Simply tilt your iOS device and you'll experience force feedback similar to using a PS3 or Xbox controller. If you’re using an iPhone specifically, you’ll feel the rumble of the engine, which increases as you go faster. 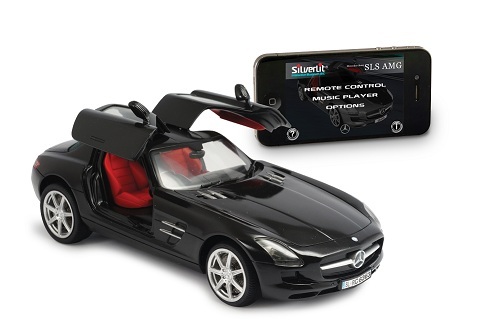 The Silverlit Mercedes Benz SLS AMG will be available starting this fall and will retail for around $129.99. Recommended for kids 8+.